All too often, participants return from a web analytics training course highly excited and motivated. But when they sit down to actually do what they want to do, they find they have not retained all that they had hoped from attending the web analytics training course. This will not be the experience if participants engage and work with us through our Analytics Capability Builder Program™. If training involves Google Analytics or Site Catalyst, we will customize the training program to use your data. Training will be hands-on, and by the end of the session, participants will leave with usable reports, profiles or segments under their own analytics account sign-in. Analytics is a learned skill, one that gets stronger with use. Rather than follow-up training, follow-up coaching to troubleshoot usage problems in specific situations may be more suitable for your learners. 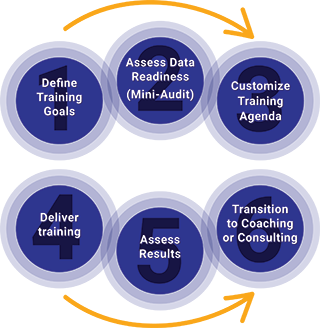 The Analytics Capability Builder Program will be customized to support your organization’s business goals and build your analytics in-house capability. Contact us to discuss your goals, wants and capability development needs.